More than 30 teenage participants from NCSY Canada’s Jewish Journeys summer program were recently treated to a VIP tour of Sheba Medical Centre’s Olga and Lev Leviev Heart Centre. Dr. Amit Segev, director of Sheba Medical Centre’s cardiac division, showed the group a short presentation of how the heart can malfunction and what doctors can do to save patient’s lives in such instances. As there is nothing like a dose of reality to enhance the experience, Segev showed the teens a live view of a medical procedure being performed on a patient suffering from a heart malfunction. As a token of appreciation for their visit – and perhaps spur their interest in a future medical career – Segev gave each participant a Sheba Medical Centre stethoscope. The Anne Samson Jerusalem Journey (TJJ) is trying to increase Jewish engagement among Conservative, Reform and non-denominational youth. A four-week summer program for public high school teens, TJJ takes participants on a Jewish heritage trip to historical and modern sites in Israel. Participant Salome Henry, 16, was born in France and later made her way to Vancouver with her family, before recently moving again with her family to Boston. She went on TJJ – which is run by NCSY (National Conference of Synagogue Youth, the international youth movement of the Orthodox Union) – two years ago. She stayed involved with NCSY after the trip, which she took while she was still living in Vancouver. The Jewish student group is looking at planning a trip next year to Israel or a one-week trip to Poland. At board meetings, they talk about upcoming holidays and there is a rabbi on hand if people have any religious or spiritual questions. 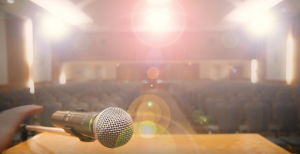 “We just received a lot of funding for next year, so what we are going to be doing is getting speakers to come and speak on important subjects and people will be able to come after school and listen to them,” said Henry. In addition to putting together the speakers program for next year, Henry is finding places where students can volunteer in conjunction with the local synagogues. “I think it would be nice to add that aspect to our club,” she said. Another thing weighing on Henry is to find ways to support Israel in the larger community. “When I was in Israel last summer, we talked a lot about what it means to be a Jew on a college campus and how to speak up for Israel, especially in terms of media,” she said. “It’s hard to really talk to people who are so against it. “A lot of kids have these ideas – they see it [Israel] in the media, which is captured very differently from what the reality is, so they immediately assume that what Israel is doing is wrong. If they took the time to analyze, they’d see what Israel is doing is logical and is what any other country would do. Seeing her go to Israel last summer with TJJ while Israel was in the midst of a conflict did not overly concern her parents, as they knew she was in good hands with a great group of kids, said Henry. And, indeed, everyone returned home safe. “The results suggest that TJJ – the trip, the subsequent educational activities and other consequences of participation – played a major role in generating increased Jewish engagement in these areas, and undoubtedly many others as well,” said the report, called The Jewish Impact of the Anne Samson Jerusalem Journey (TJJ): Increasing Jewish Engagement among Conservative, Reform and Non-Denominational Youth. Conducted by Prof. Steven M. Cohen of Hebrew Union College-Jewish Institute of Religion and Ezra Kopelowitz, chief executive officer of Research Success Technologies in Israel, the internet survey portion of the study took place last spring. Non-Orthodox alumni who had participated in summer programs since 2007 were contacted. Of the 1,784 alumni surveyed, more than 20% provided responses that could be used in the analysis. Questions focused “on behaviors and attitudes considered to be important to Jewish leaders across the denominational spectrum” in an attempt to answer the question, “Does the Jerusalem Journey help make non-Orthodox-raised Jewish youngsters ‘more Jewish’?” Responses from the TJJ survey were compared with the Pew Research Centre survey of Jewish Americans (2013), the Jewish Community Study of New York 2011 and the Birthright survey of applicants for 2001-05 but who never participated (2010). Josh and Laura Stein come from similar backgrounds – both grew up as unaffiliated Jews just a few kilometres from each other in Toronto, both became more interested in their Jewish heritage as teens through National Conference of Synagogue Youth (NCSY), and both ended up learning in Israel, where they met. Now, the married couple (along with their 10-month-old daughter Yehudis) has moved to Vancouver as Rabbi Josh Stein takes on a new role as the NCSY chapter coordinator in Vancouver, hoping to give back what they both gained from NCSY. “I attended Jewish elementary day school and a public high school. I had no affiliation really,” he told the Independent. After becoming involved with an NCSY rabbi, he said, he learned about a Jewish heritage that he never had experienced before. After high school, Stein chose to spend two-and-a-half years in a yeshiva in Israel, where he became Orthodox. At the same time, his wife to be was going through a similar journey: she also had left her native Toronto to study in Israel, eventually meeting her husband through the same rabbi who they both met in high school and had sparked their Jewish quests. After graduating with smicha, a bachelor of arts in Judaic studies, a bachelor of talmudic law and a teaching certification from the Israeli Ministry of Education, Josh Stein and his family moved back to Toronto. Recently, they found their next role, joining the Vancouver Jewish community. “There are so many people who have helped us along the way in becoming Orthodox that we really felt that it was part of our duty to give back to the community and allow other students to be as fortunate as we have been in discovering our Jewish heritage,” said Stein. As part of his new role, he’ll be organizing educational and social events for Jewish students in Vancouver, from Shabbatons to paintball sessions and weekly learning classes. “Essentially, my job is to work alongside Rabbi [Samuel] Ross and bring in new energy to the younger kids coming in,” said Stein. They’ve already held the first Vancouver Shabbaton of the year, which brought together about 100 kids from Western Canada, as well as Seattle and Portland, to spend a Shabbat together in Vancouver. “The kids had a blast, there was so much camaraderie and this feeling of being part of a greater community,” he said. They have also started weekly Torah High learning classes and have many programs lined up for the year. 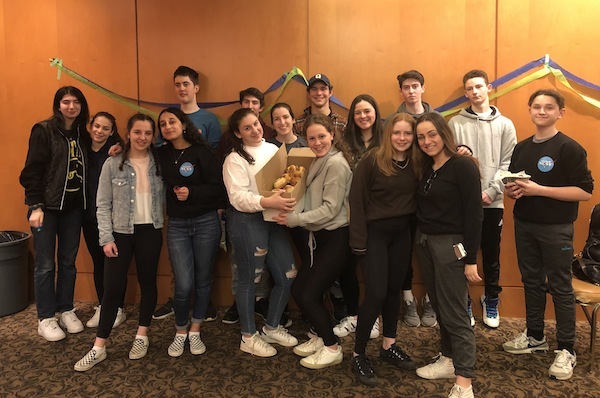 NCSY, which has been in Vancouver for about 50 years (and is now in its 60th year nationally), aims to help Jewish teens discover and connect with their Jewish roots through fun, informative and educational programming and mentorship. Although Vancouver is known for its high intermarriage and assimilation rates, the number of Jewish youth involved in NCSY has grown in the past few years, which is one of the reasons why the chapter brought in the Steins. “We brought them in due to sheer growth,” said Ross, NCSY Vancouver city director. “We are now seeing well over 200 kids a year. Perhaps five [or even two] years ago, kids were coming in here and there; now, the kids are coming in for two, three, four or five times every week for programs. The Steins are looking forward to being part of the growth of Vancouver NCSY. Vicky Tobianah is a freelance writer and editor based in Toronto. Connect with her on Twitter, @vicktob, or at [email protected]. In a Jewish community with one of the highest assimilation rates, the role of youth groups such as the Vancouver chapter of the National Conference of Synagogue Youth (NCSY) has become more important over the years. NCSY Vancouver’s parent organization was founded in 1954 and the local chapter, which emerged about a decade later, is helping celebrate the 60th anniversary milestone. NCSY works to develop a connection with Jewish youth before they embark on their university and professional lives. Rabbi Samuel Ross, NCSY Vancouver director, spoke about the “unique, beautiful situation” in which the chapter works. He said they “cater to anyone and everyone, which is an ongoing challenge but it’s really reaping rewards.” Indeed, many of those who join or take part in NCSY activities develop lifelong connections to Judaism and Israel, which was Nicole Grubner’s experience. Grubner grew up in West Vancouver and became involved with NCSY when she was in Grade 9. She started attending their Shabbatons, and loved the warm atmosphere and Jewish connection that she felt at these events. By the end of high school, she was on the NCSY student leadership board, began keeping Shabbat, and had signed up for a post-graduate year at a seminary in Israel. NCSY Vancouver hosts a mix of educational and social programs, everything from a mock casino night to sushi in the sukkah to Shabbatons, trips and leadership programs. In Grubner’s case, after her year in Israel, she studied at Stern College in New York, returning to Israel every year. Her love of Israel and connecting with the Jewish people didn’t dampen after university ended. In October 2012, she made aliyah. “It had a very big impact on my life, so much so that I made my best friends and closest connections in NCSY. I’m really grateful for the base it gave me, for the fact that I was able to get so involved and so connected in high school,” she said. “In Vancouver, we know that assimilation is a really huge problem, so NCSY is really important to the Jewish community in Vancouver because it’s a connection point, one that many kids don’t get the opportunity to be a part of. NCSY has really changed the face of Vancouver’s Jewish community,” she said. NCSY is a globally recognized organization that connects Jewish youth through social, recreational, educational and spiritual programs. In Vancouver, the number of Jewish youth involved in NCSY programming has been growing. This year, they’re sending 16 youth to programs in Israel. Some of their programs draw 100 kids, and there are already 25 applicants this year for the NCSY Vancouver youth board.